(a) Check the cabin for any object that might interrupt radio reception or additional devices which use radio waves on the instrument panel. If such an object exists, remove it and check if the GPS mark reappears. The GPS uses extremely weak radio waves originating from satellites. If the signal is interrupted by obstructions or other radio waves, the GPS may not be able to properly receive the signal. (a) Check if the vehicle is in a location where GPS signal reception is poor. If the vehicle is in such a place, relocate the vehicle and check if the GPS mark reappears. The GPS uses 24 satellites in 6 orbits. At any point in time, 4 satellites should be able to pinpoint your vehicle. However, GPS signals may not reach the vehicle due to influence from the surroundings, vehicle direction and time. 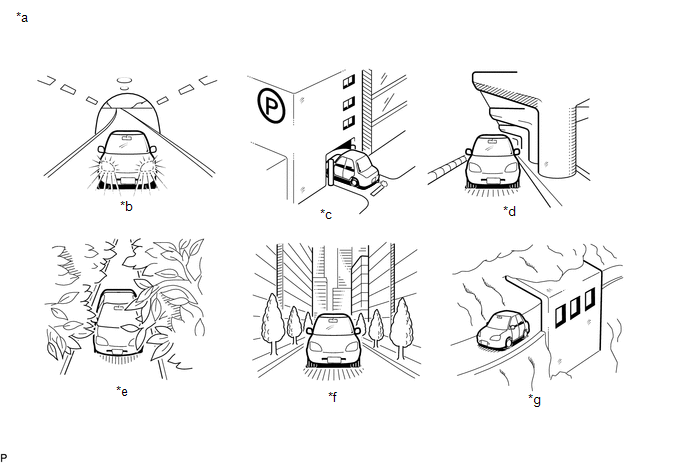 For examples, see the following illustration. The GPS mark is displayed. (a) Enter the "System Sensor Check" screen. 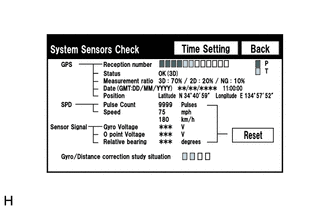 Refer to Check GPS & Vehicle Sensors in Operation Check (See page ). (b) Check how many of the following codes appear in the "Reception number" column. At least 3 codes appear.